Bhagavad Gita is a holy book of Hindu religion. 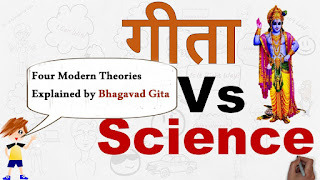 I will tell you Four scientific fact which was already mentioned in Bhagavad Gita five thousand years ago. You may be surprised to know The great scientists and Reachers read Bhagavad Gita, They read not for any religious things. Actually, they read to learn for scientific fact. There are too many theories which are related to Bhagavad Gita slokas. There is every problem solution in Bhagavad Gita. Even you believe in god or not. Even if you don't believe in god. You should read Bhagavad Gita as the science book. Many peoples say Bhagavad Gita is best for psychology. But Only some peoples know that there are physics, biology, maths and astrology. There were too many discoveries on this topic. I will explain some of the theories which were mentioned on Bhagavad Gita. First law of thermodynamics state that Energy neither be created nor be destroyed, But It can be transferred one form to another form. Which is also called Conservation law of energy. Example: You know about the generator. There is a magnetic coil in the generator. When the generator starts then this magnetic coil starts to spin. Then it produced electricity. It's means generator transfer mechanical energy to electrical energy. VERSE 17: That which pervades the entire body you should know to be indestructible. No one is able to destroy that imperishable soul. VERSE 22: As a person puts on new garments, giving up old ones, the soul similarly accepts new material bodies, giving up the old and useless ones. VERSE 23: The soul can never be cut to pieces by any weapon, nor burned by fire, nor moistened by water, nor withered by the wind. If your thinking here is talking about soul then what is the connection with energy? Since the soul is part of the energy. Modern science also believes the soul energy. After our death which is released from our body. Even Its huge amount or little amount. But There is some kind of energy which is released from our bodies. Again think about it. Because of five thousand years ago, Its already mentioned. Which is modified as a conservation law of energy. There is some kind of technic in China and Japan. Which can control our subconscious mind? And also heal against stress, tension, anger, tried and increase the focus of your mind. And we can solve the problem with peace of mind. It's technic, and significance is defined. Which technic china and Japan says it's their technic. In Bhagavad Gita says "अहम् बिजा प्रदाह पिता "
which means that all life in the world. One life is born from another life. It is not a possible spontaneous generation. If any life born with non-living things like the machine, then it is called spontaneous generation. Some people know about spontaneous generation theory. it's like a imagine. No-one proved that life can be created by matter. The great scientist Louis Pasteur explain in his theory of spontaneous generation. Life can't be created by spontaneous generation. He was the first scientist who discovers pasteurisation technic. He boils the milk and pasteurised. Means all living things are killed. This is the cause this milk didn't spoil. There is no fungus. The fungus is like living bacteria. In this way he proved life can't be created by spontaneous generation. And in Bhagavad Gita, It is also mentioned. Shree Krishna told Its world is a matrix(simulation). And He is the programmer of its universe. when Lord Brahma(creator of the universe in Hindu religion) get proud for he is the creator universe. And Krishna calls many another Brahma to from another universe. And Its also define in Bhagavad Gita about multiverse theory. Modern science believes multiverse is a strong hypothesis. Example: All computer in the world is connected with the network similarly Universe is connected to each other. Its also believes that if something is gone in the black hole its go to another universe. Do you think these advanced theories are already defined in Bhagavad Gita? There are too many scientific facts like this, which already mentioned in Bhagavad Gita.